Kristyn Goddard was new to the kennel business when she started one in Texas in 1995, but she knew right away that the caged dogs were unhappy, and she was determined to find a better way to do it. At the time, all kennel owners believed that the only safe way to board dogs together was to lock them up so that they couldn’t fight and injure each other, but Kristyn reasoned that if some dogs could get along without fighting, why couldn’t they all? With the help of an expert dog trainer she soon learned a very important fact: all dogs are inherently social pack animals. This means that they can get along with other strange dogs in an unfamiliar environment as long as they are in a balanced pack with a strong, confident, and fair leader…an alpha dog (…in our case, a well-trained dog handler). She found that if you evaluate every dog first, and determine that each dog can be “socialized”, and follow the steps of careful introduction, pack socialization, and consistent leadership, that a balanced pack can be created and maintained in a dog boarding facility 24-hours-a-day. 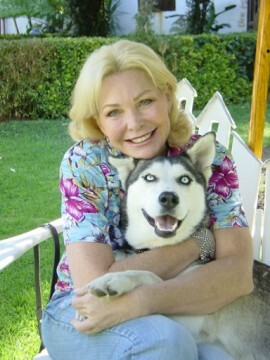 Kristyn moved their operation to Southern California shortly after that, and opened Paradise Ranch as the first fully-licensed cage-free dog boarding facility in the United States. At first her concept was shunned by other kennel owners, but when they saw her success, they quickly began to embrace the idea and opened cage-free facilities of their own. And now, because of Kristyn’s empathy for a few kenneled dogs in Texas in 1995, literally hundreds of thousands of dogs are boarded in a more humane manner than before. ♥ “Water Park for Dogs” Grand Opening- KABC, KNBC, KCBS, KTLA, KTTV, KCOP & more! The story doesn’t stop there. Kristyn wanted her clients’ dogs to not only be boarded cage-free, but she insisted on doing it in a true-home environment. She wanted the dogs to play in real outdoor yards, and she wanted them to sleep in real homes with real furniture, just like at home. She knew that this more familiar environment would make the dogs more comfortable and less stressed out. And she wanted the accommodations to be first-class, just like a tropical resort for people, and today Paradise Ranch accomplishes all of her goals. Paradise Ranch is truly a very unique facility, and has been featured in dozens of newspapers, magazines, cable and television shows and web sites. The owners and staff of the Ranch are more than happy to accommodate the press in any way to help create a great story.